13 Best New Sci-Fi & Fantasy Books: February 2018 | Nerd Much? We’re officially in the middle of the cold heart of winter—but if you’re like me, you know that the cold weather is just a good excuse to stay inside reading. This February has a lot to offer—it’s packed with debuts and some long-awaited sequels. Some of the genre’s masters, like Tamora Pierce and R. A. Salvatore, are returning to their classic worlds with new stories. And newcomers, like Anjali Sachdeva, are setting out with bold debuts and paving the future for the genre. There’s something here for any reader this month, and it doesn’t matter whether you’re a sf/f veteran or you’re testing the waters for the first time. We’re still just in the start of a year of great new releases. Last year’s The Gilded Cage explored a London where the magic-wielding upper class forces the rest of society to perform ten years of service at some point in their lives. We were introduced to the Jardins and the Hadleys, two families from the opposite ends of society. Tarnished City is the second book in the Dark Gifts trilogy. This time around, the Hadleys and Jardins stand on two sides of a conflict that threatens to upend the order of things. Magic grants too much power in too many forms, and Abi and Luke Hadley stand up to the oppressive system that rules them. James has created a very different sort of dystopia—and one that is plausible in a world where magic allows people to bend the will of others. Arram is the youngest student at the Imperial University of Carthak. He’s ambitious, and this makes him many close friends and bitter enemies. This coming-of-age tale is the first in Pierce’s new Numair Chronicles series, which will expand the lore of Tortall and explore the character of Numair Salmalin. This comes hot on the heels of Tortall: A Spy’s Guide and leaves us with no doubt that we’ll be hearing stories from the Tortall universe for a long time. Set in his fantasy world of Corona, Child of a Mad God introduces new fantasy series from the prolific R. A. Salvator, known for DemonWars and his Forgotten Realms books. This new saga follows Aoleyn, a young woman capable of great magic and her struggles against a monstrous warlord and a dangerous tribe. Child of a Mad God sounds like it will be a great introduction to Salvatore for newcomers and a fresh adventure for longtime fans. Science fiction genius Elizabeth Moon’s newest series, Vatta’s Peace, marks her return after a ten year hiatus. The second book in the series, Into the Fire, follows Kylara Vatta as she leads a team of crash survivors on an arctic island. While there, they discover a strange base that holds secrets about a strange organization, the planets government, and Ky’s own family. It’s fantastic news that Moon is writing again, and this latest series is a great place to start if you’ve never read her before. This debut novel is a historical fiction with a bit of magic—and science. Set in America during World War I, The Philosopher’s Flight follows the young Robert Weekes and his fledgling career as a magician (or philosopher). He hopes to join the U.S. branch of magic-wielding flying medics as his mother did, and he is accepted to Radcliffe College, an all-women’s school. Miller’s approach to magic is scientific rather than mysterious, and his vision of early-1900s America is unique and intriguing. There’s a bit of a reversal of today’s issues, as Robert faces prejudice in his attempts to prove himself to his female philosopher colleagues. It will be interesting to see how Miller handles this and what parallels he draws to the social movements of today. In 2072, the moon’s helium-3 is a valuable resource in the effort to save a dying Earth. After a bomb kills a miner, the moon becomes more dangerous than it already was. Caden Dechert runs the U.S. mining operation on the moon, and he is determined to figure out who is responsible for the attack. During his investigation, Dechert uncovers a secret that threatens to spark war on the moon and endanger the planet. Don’t miss out on this political space thriller. Tina LeCount Myers’s debut novel is the first in a Scandinavian-inspired epic fantasy an trilogy. Irjan started a new life in Davvieana with the hope of focusing on his family. But his past was never completely forgotten, and Irjan finds himself crossing over to the world of the immortal Jápmemeahttun. Irjan’s story will be defined by a choice he makes—one that will change the fate of his people and himself. If you’re already as intrigued as I am, you should know that the second book, Dreams of the Dark Sky, is expected this fall. One half of the bestselling Gears husband-and-wife writing duo, W. Michael Gear sets his sights on space. Outpost is certainly ambitious, but it could be the start of a great new sci-fi series. Donovan is a wealthy planet that offers much to its people and to newcomers. But it’s also rife with danger, and is quickly devolving into chaos. Gear has pitted the intents and wits of several characters against each other. There’s Talina Perez, the ruler of a colony who is trying to hold things together. Kalico Aguila, supervisor of the ship Turalon, sees in Donovan a chance to fix something broken and take control. Captain Max Taggart will restore order in Donovan one way or another—as long as he can deal with Talina Perez. And Dan Wirth is a murderous psychopath with a death sentence who has come to the planet seeking salvation. From my estimation, there won’t be a happy ending for at least three of these characters. And that might be a generous estimation. Anjali Sachdeva’s debut is a collection of stories from a variety of time periods and places. Each story is an ambitious imagining of people in extreme situations. Sachdeva imagines the lives of the survivors of a Boko Haram kidnapping. People of the old American West seek refuge in an underground world. Genetic modifications and new diseases challenge two parents’ perspective on science. Each story offers a bold vision with familiar human elements. This is not a collection to pass by. Sage is eighteen and homeless on the streets of Los Angeles. When she and her friend Ziggy are invited to a party with the promise of food and a hot shower, Sage discovers a world of gods and goddesses — the Otherworld. On top of that, Sage herself is apparently the daughter of a Celtic goddess. Sage must quickly find her footing in a world of magic, alliances, and glamour. From the world of The Faithful and the Fallen quartet comes a new series, Of Blood and Bone. The Ben-Elim are warrior angels who once defeated by a demon army and now rule over the Banished Lands. Their rule is harsh, and there are signs that the demons may be gaining strength. A trapper named Drem finds corpses affected by dark magic, while Riv, a young and frenetic soldier from the south, discovers a schism within the Ben-Elim. These two characters hold powerful knowledge that may affect the future of the Banished Lands. Dark forces are gathering, and an ancient conflict is just on the horizon. John Gwynne is sure to recapture the magic of his fantastic world with a fresh cast of characters in this new saga, and that’s why this is one of our most anticipated fantasy books of 2018. Myke Cole (author of The Shadow Ops series) is making his first step into epic fantasy, and we couldn’t be more excited. The Armored Saint introduces a world where magic is forbidden by the Order because, simply put, any magic use risks opening a portal to hell. One girl, Heloise, knows firsthand what evils the Order is capable of and dares to oppose them. Epic fantasy doesn’t have to be long — just epic. With The Armored Saint coming in just over 200 pages, it’s sure to be a powder keg of action, which is why it”s one of our most anticipated new fantasy books of 2018. Rachel Hartman tells the story of Tess, a young woman who has never quite fit in and makes a mistake that even further removes her from society. Set in the same world as her bestselling Seraphina, the story follows Tess as she flees a nunnery and goes… anywhere else. She isn’t entirely sure where she’s headed, but that’s the fun of the journey. This standalone story of the incredible world of Southlands should be a fun adventure tale and character study—and if the gorgeous cover is accurate, there will probably be dragons. 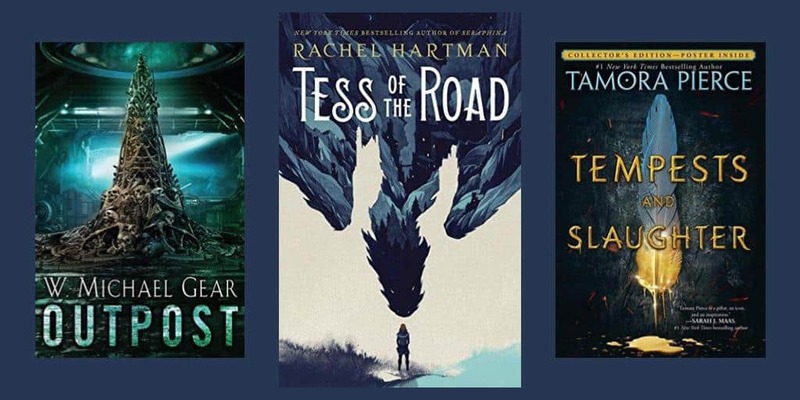 You can find our full list of 2018 sci-fi and fantasy book releases for the entire year here. Did I miss anything? Let me know in the comments!